SURVIE TRANSE PERCE was dedicated to the Cuban artist Hessie, whose work consisted in embroidering on large unbleached canvases, with threads of colors, geometric drawings, repetitive, with obstinacy. I went to her house, in the country, on the edge of a lake, in her mill surrounded by meadows, and here is the scenario: I filmed her lying in a narrow black boat on the grass; she sewed herself in this boat, the wire crossed from one side to the other to bind herself. The image generated a fantastic effect. "Survival Trance", the English title of this film, screened in a New York gallery, participated in debates on the process of women's creation: the invitation card attests to this. Other projections took place at the Museum of Modern Art at the Pompidou Center. -Mythia Kolesar, "Transe Perce Survie", for the exhibition Environnement Mythia: from deep inside, Nogent-sur-Marne, National House of Artists, 2012, p. 50-52. 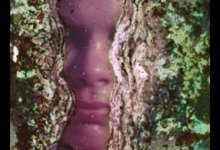 The only reel of Mythia Kolesar's film SURVIE TRANSE PERCE that has been located comes from the artist Hessie's family. It is an 8 mm coil which has not been kept in good condition and has been greatly deteriorated by moisture. Throughout the film, visual alterations occur in the image, sometimes forming a sort of floating frame to the original image. The original film is a portrait of Hessie by filmmaker Mythia Kolesar, Hessie's friend. The soundtrack that accompanies it is composed of poetic fragments told by Hessie in English. A standard quality DVD copy was used for the projections made since 2015. In summer 2018, Bill Brand restored the film and transferred it to a digital file. The restoration reinstate the original speed of the images with a high definition resolution and corrected the distortions of the sound. The "ruin" of the original film seems transfigured by the test of time.